Real-time content is organic, made up of individual elements that can be accessed and reworked, changed, deleted or added to as often as is required. This means the attraction media can be changed and adapted on-the-fly, story paths can evolve depending on player choices made, new levels can be unlocked when high scores are achieved, and player voting can affect the direction of the game. Real-time media is changing the potential scope of attraction design, putting true interactivity, mixed reality and personalization of the journey into the hands of every user. We believe this will become the new minimum benchmark in experiential design for the attractions industry. It’s no longer just about the core attraction. Real-time media and interactivity can be extended to all facets of the experience: the queue lines, the pre-show, post-show and even retail areas, increasing guest engagement on multiple levels. Real-time media uses game engine technology, also known as image generation, rather than traditional linear or pre-rendered content. Real-time content is organic, made up of individual elements that can be accessed and reworked, changed, deleted or added to as often as is required. This means the attraction media can be changed and adapted on-the-fly, story paths can evolve depending on player choices made, new levels can be unlocked when high scores are achieved, and player voting can affect the direction of the game. It facilitates and simplifies retheming attraction media for seasonal or special events. Within the real-time arena, attractions can also be guest personalized live at the park or through pre- and post-park engagement via social media and apps or updated with seasonal upgrades. Corporate brand elements can also be easily embedded to attract a wider audience and alternative revenue models. This can also be achieved by extending the experience around core attractions when combined with gaming elements that can be completed outside of the main attractions space. For example, as part of a park’s general iOS or Android app, guests can download an extended experience to engage with elements of the different attractions before queuing and riding, using gamification within the park enhanced with our Augmented Reality technology. This allows guests the ability to earn points, upgrades or personalization of the attractions before riding. For attraction destinations that have a high rate of returning visitors, such as FECs, this approach also increases attraction repeatability as the experience can be different each time, depending on the path riders choose to take or their game play status unlocking secret elements, power-ups, achievements and bonuses. Theme parks, FECs and visitor attractions have a constant need to differentiate themselves and their out-of-home entertainment offering, and to keep raising the bar. With so much high-end home entertainment technology easily available to consumers, the experiences people have in paid-for leisure spaces need to be significantly scaled up to levels unavailable anywhere else. At the same time, in-home and out-of-home facets of the experience can be developed to reinforce one another. That’s one of several areas where Holovis is focusing R&D: to connect the in-home and out-of-home technologies into a seamless, totally integrated experience. The area we see creating a step-change in experience design is when the two realities of VR and AR dynamically combine in real time, allowing the creation of a Mixed Reality (MR) environment. MR allows the user to move freely and safely in the space whilst being exposed to amazing effects and extending the boundaries of storytelling. What’s real and what’s imagined are now blended using the core VR and AR technology alongside projection mapping, actual show sets, virtual assets, spatial audio and special effects. This has the power to take guest immersion to a whole new level, with the added benefit that the gamification layer introduces almost limitless possibilities for individual gameplay and group interaction as well. Holovis Media believes in the future of Mixed Reality to the extent that we have created an internal team of dedicated MR specialists. The team includes technologists, solution architects, story tellers, creatives and programmers, supported by test-cells, demonstration and R&D facilities at our UK head office. They are already engaged in creating immersive experiences for several major clients. Behind the scenes in the visioning and development stages of a project, real-time media is influencing attraction designers to approach their work differently, from an experiential viewpoint. The use of virtual reality CAVEs and proprietary software solutions such as Holovis RideView™ technology means that attractions and experiences through to whole site masterplans can be visualized in interactive 1:1 scale through 3D volumetric projection, with the world moving to the true perspective of the user though head- and hand- tracking devices. This technology facilitates more accurate design review, simulation and testing of an entire park or attraction, including facility impacts and layouts, as well as sight-line analysis right down to individual seat level, taking into account the range of permissible guest heights. RideView™ has already been applied in major attraction and park development projects and we find that it facilitates higher quality decision making across a range of functional requirements, while saving money and reducing risk. Transporting theme park guests into alternative realities calls for a precise integration of purpose designed real-time, intensive game play with complex 3D immersive visuals, spatial audio, organic and dynamic motion technology, highly accurate interactivity and special effects. 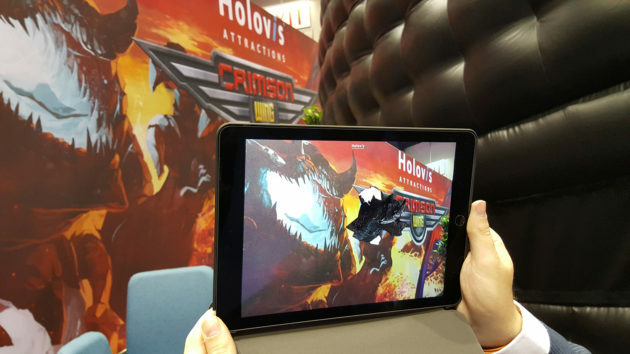 We think that’s best done internally, and so Holovis relies on its in-house software development division and creative media and game development teams to facilitate turnkey solutions under the Holovis Attractions and Holovis Media brands. Having the creative design team involved at every stage of a project generates creative storytelling that informs the final experiential design, while making sure guests are at the heart of the story with the right technology and hardware systems to deliver the required immersion and engagement throughout. Holovis (www.holovis.com) is a world leader in sensory experience design in the Entertainment, Industrial, Retail and Retail Brand sectors.